This house at 37/1 Arbat is a throwback to another age. 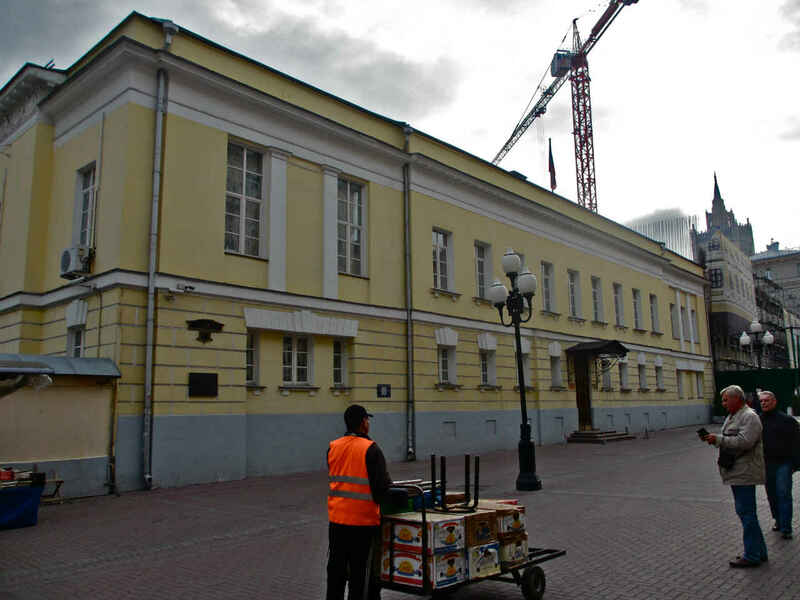 It was built in the late 18th century – the oldest remaining building on the Arbat – and, after damage suffered in the fires associated with the Napoleonic War of 1812, it was reconstructed. What we see today is the result of work done in 1834. Quite a few people of note have lived in or visited this home. 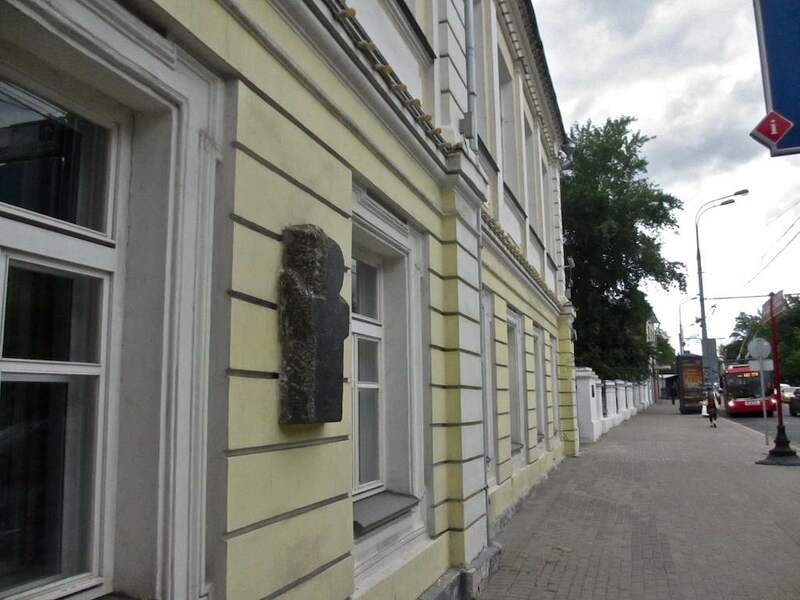 Today we’re interested primarily in Dmitry Sverbeev (1799-1874), who was born here, and Yekaterina Semyonova (1786-1849) who lived here for a time from 1834 to 1835. Sverbeev was a diplomat who loved literature and writers and befriended many of them. He described his own interest as such: “I sometimes love to read a bit and listen to intelligent conversations.” He knew Alexander Pushkin and appeared to be rather close to Nikolai Gogol, which is a little bit like a tiny planet orbiting two super-suns. Sverbeev spent a good deal of time with Gogol abroad and, when the writer found himself in financial difficulties, the friend generously gave him money to keep going on. (Sverbeev in general seems to have been a generous man, often helping out people who were not as well-situated as he. In a stroke that says much about him as a person, he never wrote about any of this in his memoirs.) Sverbeev was not as close to Pushkin as he was to Gogol, although the poet did attend Sverbeev’s salons in Moscow in the 1830s, and they crossed paths in various places for many years. Interestingly, one story from Sverbeev’s memoirs, My Notes (written in retirement in Switzerland and never intended for publication), involves Pushkin and Semyonova, a famed actress who counted Pushkin among her admirers. Semyonova is one of those shooting stars that history tosses up every now and then. She was an uneducated, apparently illiterate peasant who, thanks to her fiery temperament, became one of St. Petersburg’s and Moscow’s most popular actresses of her time. She particularly shone in the romantic dramas and tragedies of Vladislav Ozerov, himself a huge star playwright whose fantastic popularity died utterly within just years. 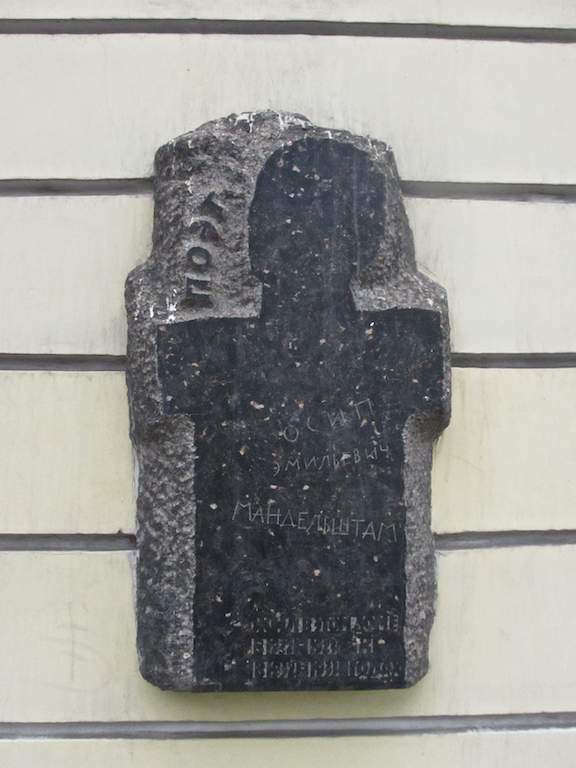 He had the misfortune of being a pre-Pushkinian writer, and was soon wiped from the memory of his countrymen. (You will see Pushkin do a bit of the wiping himself in a long quote offered shortly below.) Nobody has performed Ozerov plays for decades, if not centuries. Be that as it may, four of Semyonova’s first six major roles were in plays by Ozerov (stress on the first syllable) – Oedipus in Athens (1804), Fingal (1805), Dmitry Donskoi (1807) and Polyxena (1809). She also shined in Yakov Knyazhnin’s Rosslav (1805) and several foreign plays: Friedrich Schiller’s Maria Stuart (1809), Corneille’s Ariana (1811) and Racine’s Iphigenie (1815). She debuted in 1802 and joined the company of the Alexandrinsky Theater in 1805. Depending upon the source, you can read all kinds of probable nonsense about Semyonova; what a hothead she was, how ignorant she was, how lazy she was, how covetous she was… You can always read things like that about popular, to say nothing of great, actors. I think Pushkin’s characterizations beat the hell out of all the snippers, snappers and snipers combined. I just have a feeling (say I with no small sarcasm). In any case, Semyonova’s career took a downturn in the years 1815 to 1820 and from then on she performed less and with less success. She moved to Moscow in 1827 and the following year married Count Ivan Gagarin, the man who had been her lover and had given her several children. It wasn’t the happiest of arrangements, but it became worse after his death in 1832. At least as late as 1830, Pushkin is said to have attended her performance in an amateur production in Moscow, but it was a far cry from her glory days. By the time Semyonova lived briefly on the Arbat, her acting days were effectively behind her. I’ve been hanging around the same basic place in Moscow this week. 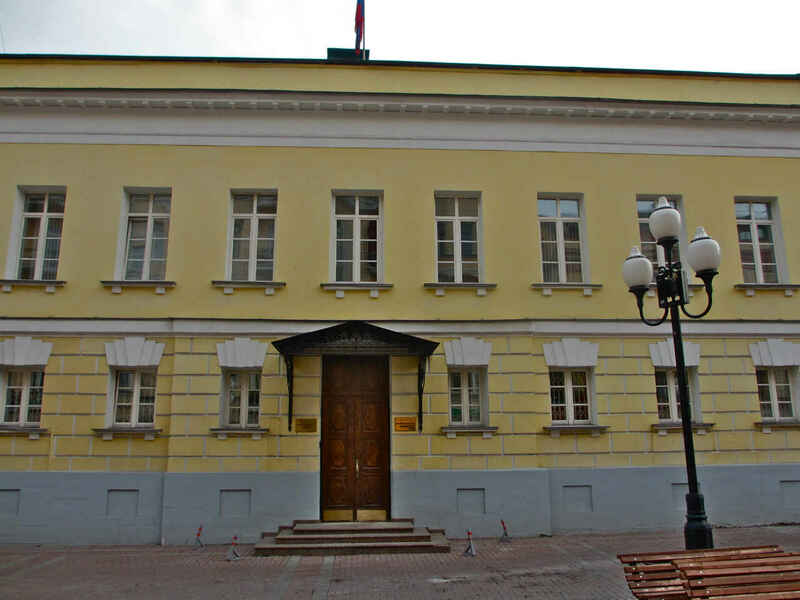 The Yermolova House, which I wrote about a couple of days ago, is a few doors down from the home we’re talking about today at 25 Tverskoi Boulevard. Yesterday I wrote about the Alexander Herzen statute which stands right next to it, because Herzen was born here. Today we’re interested in the house because the great poet Osip Mandelshtam lived here in 1922 to 1923 and then again from 1932 to 1933. This was quite a place actually. 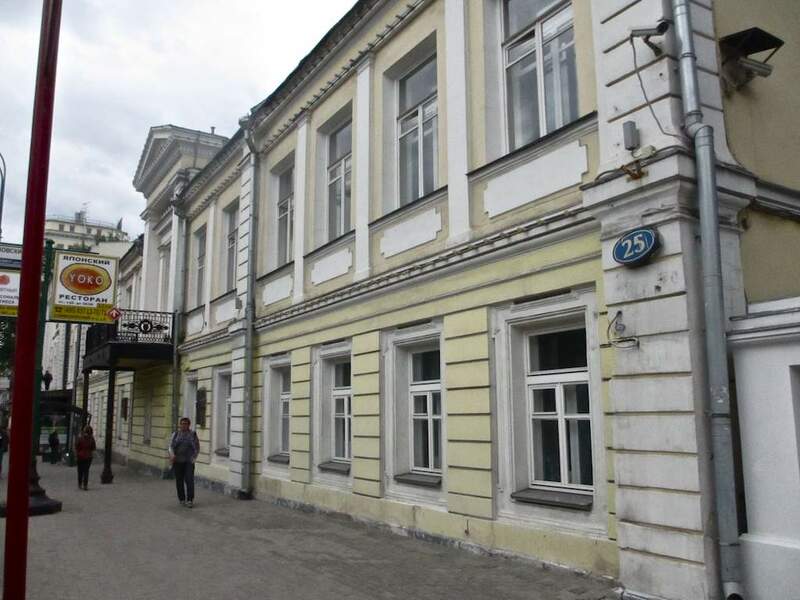 Aside from the Herzen connection, and the fact that Mandelshtam and Andrei Platonov lived here (I’ll write about Platonov soon), this was the site of a popular literary salon hosted in the 1840s and 1850s by the Russian diplomat and memoirist Dmitry Sverbeev. 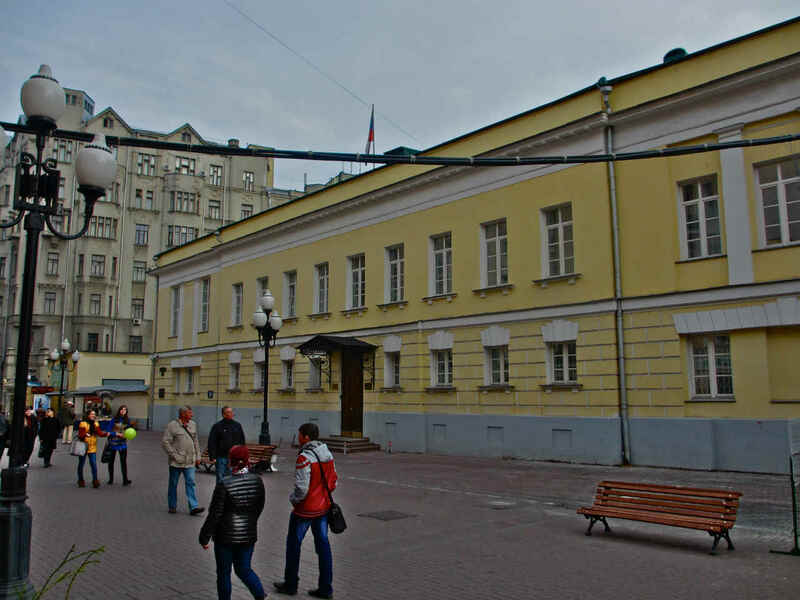 The so-called Sverbeev Fridays were frequented by Herzen, philosopher Pyotr Chaadayev, poets Nikolai Ogaryov and Yevgeny Baratynsky, and prose writers Konstantin Aksakov and Nikolai Gogol. 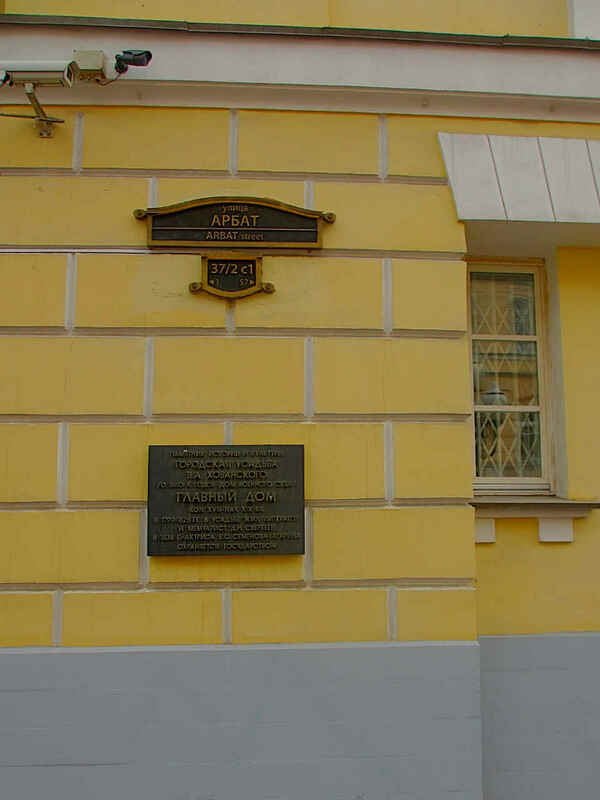 The literary critic Dmitry Blagoi lived here, as did, more briefly, the writers Mikhail Prishvin, Vsevolod Ivanov and Boris Pasternak. 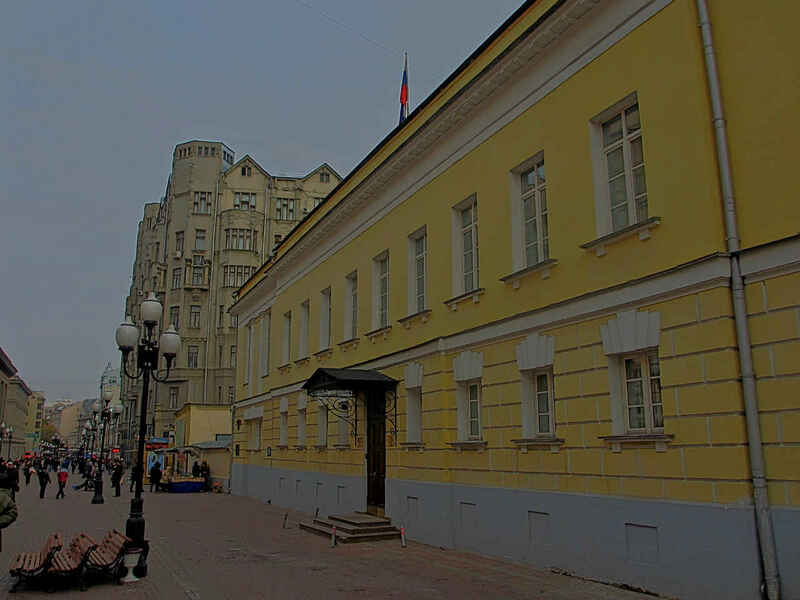 Russia’s primary literary institute, named after Maxim Gorky, has been located here since the 1930s. Finally, this is the place that Mikhail Bulgakov had in mind when he satirized the writers club in The Master and Margarita, in part because this is where the notorious RAPP, Russian Association of Proletarian Writers, was located in the 1920s. 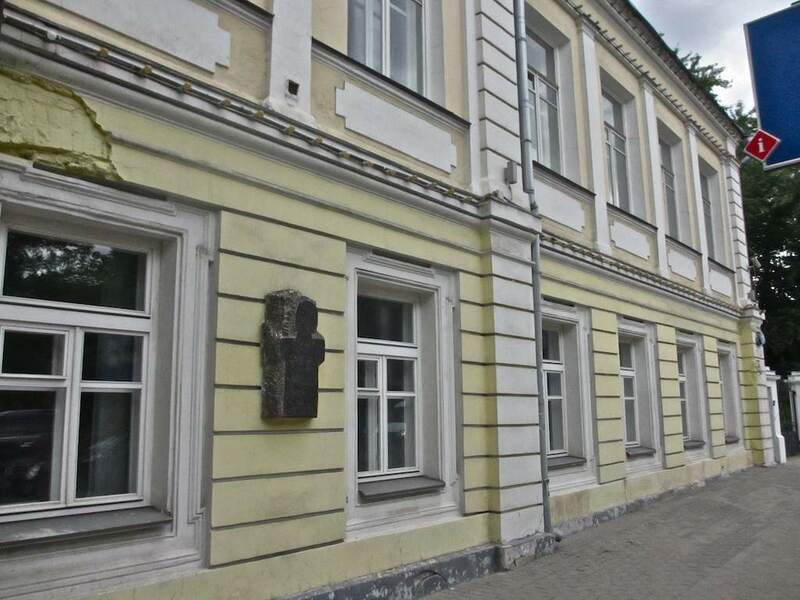 Mandelstam (which is pronounced “Mandelshtam”) wrote about his humble abode, which he shared with his wife Nadezhda, to a friend in the spring of 1932: “They gave me a space in a damp wing that is not suitable to be lived in. It lacks a kitchen, the faucet for drinking water is located in a rotting bathroom with moldy walls and plank partitions, a freezing cold floor, etc. I didn’t get the room that was allocated to me in the wing right away and was temporarily situated in a tiny hole of 10 meters where I spent the whole winter.” So much for any sentimental thoughts of the great poet living it up in one of Moscow’s most famous buildings. Of course, the notion of sentimentality and Mandelstam do not mix in the least. He was a spectacular poet of superb technical prowess. His prose writings are considered to be among the crispest and cleanest of any in the language. Born in 1891, he published his first verses as a student in 1907 and published his first book in 1913. 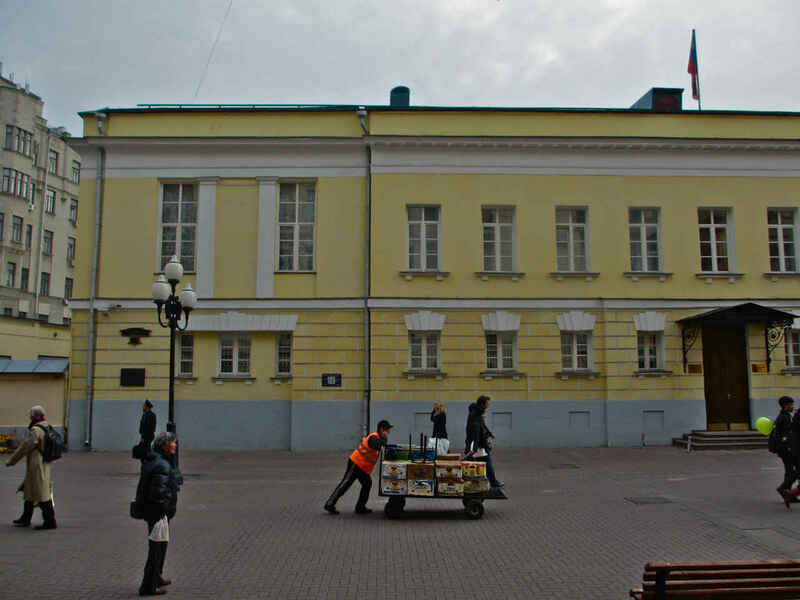 He studied abroad in Germany but chose to return to Petersburg to enter the university in 1911. 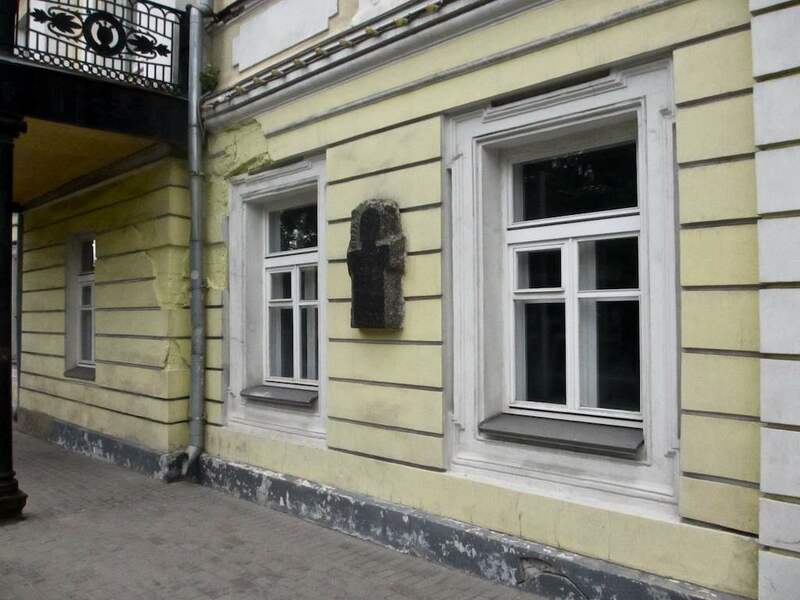 This is important in regards to the plaque that was erected in honor of Mandelstam on the facade of 25 Tverskoi Boulevard. 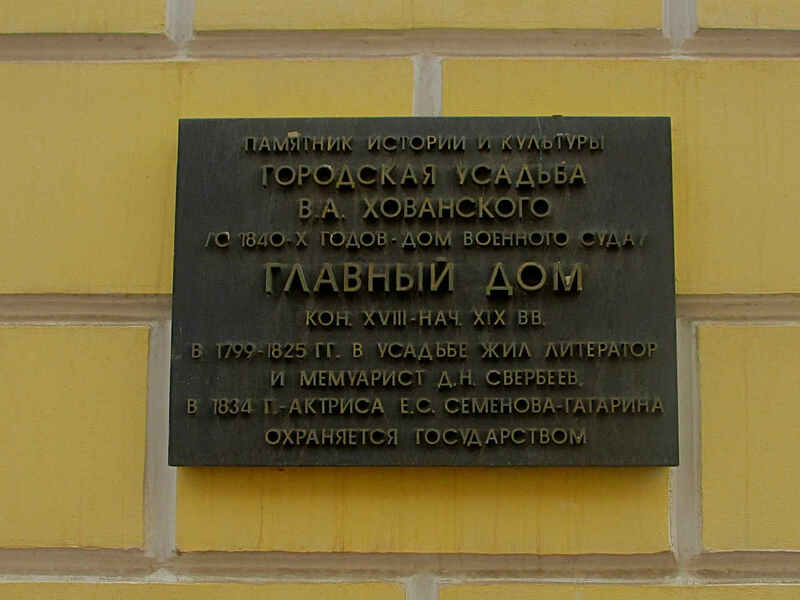 Because in order to enter Petersburg University the Jewish Mandelstam was compelled to convert to the Methodist faith. This explains, I guess, why the plaque commemorating this great Jewish poet is designed in the form of a cross. The bulk of Mandelstam’s work came between 1922 and 1933, coincidentally, perhaps, the years that begin and end his time in this building. Somebody in Soviet Russia had it in for Mandelstam and that became doubly true after he wrote the poem “Stalin Epigram” in November 1933. He was arrested and exiled a couple of times, and ended up dying of typhus Dec. 27, 1938, in transit to the Siberian labor camps.